A bad online registration form online has sadly become as American as apple pie. The vast majority of them collect useless information, present an annoying barrier to engagement and generally are reviled by anyone who is unlikely enough to have to fill one out online. For the amount of pain involved, you would think the benefits would be life altering. When you fill out the long registration form before a first doctor’s visit, the up side is that you should get better and more informed treatment that won’t unintentionally kill you. Online registration forms rarely have a comparable benefit. Of course, we all want to build our lists of people who might buy our stuff. Online registration forms, in general, are meant to capture those types of leads and build the almighty customer database that we all want to have, whether we know what to do with it or not. The basic question you need to ask at the end of it is how much of the information you are currently collecting are you really using for anything that helps your business? The unfortunate reality is that you are probably collecting lots of information you don’t need, and missing out on some of the most valuable information that you should be asking for. Here are 5 tips on how you might be able to revamp your online registration form to give you more valuable information, get more people to actually fill it out and use it not just as a way to build your database, but also to get more insights about your potential customers. Understand your abandonment rate. The first question you should ask before you even start to revamp your form is what is your “abandonment rate?” Put simply, this is the difference between the number of people who visit your form page and view it, and those who actually fill it out and submit it. Understanding, for example, that only 1 out of 50 people who visit your contact us form actually fill it out gives you a starting point to improve on. Separate form functions. The problem with having one form for everyone is that the information you might ask a current customer for is different from what you might as a potential customer, or a local journalist who wants to profile your business, or a partner/vendor who might want to work with you. Consider having different forms where you can tailor your questions to those audiences. Include optional questions. Does every question on your form really require an answer? Doing this, you end up with a list of questions that may make your form too much work. Instead, consider the questions that you really need answered and make the rest optional. Kill your irrelevant questions. Are you asking for a phone number that you don’t need or a mailing address when you never mail anything to your customers? Forget the “standard” fields of a online form and think about what you really want to know. Always ask for a blog or Twitter URL. The one fundamental truth about anyone who has built up any kind of audience online through a blog or on a tool like Twitter is that they are usually more than happy to share their social media prowess with you. Give them a field on a form where they can tell you just how important their social network is and you will almost always get a response. Give them multiple options to be contacted. 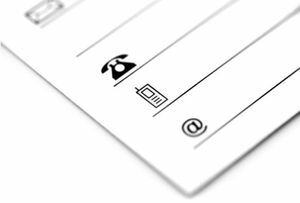 Most of us prefer a certain form of contact, and even though we might volunteer our email address and phone number – what we really want is for you to only email us and NEVER to call. Try to capture that information and you will be one step ahead of your competitors. Ask how they found you. How will you know if your online marketing is working unless you get a sense from your potential leads of how they found you? Make sure to always ask if someone came to your site from online search, or seeing a billboard, or a referral, or any other way that you might be promoting your business. Knowing the answer to this question will help you to make better marketing decisions in the future. This post is republished from the original article I wrote for the American Express Open Forum website. It is part of "Small Business Friday" on this blog (though sometimes I'm a day late!) – a featured series on ideas and marketing techniques for small businesses. To read more articles like this, visit the "Small Business Friday" category on this blog.